French painter and architect, of Swiss origin (La Chaux-de-Fonds, 1887 ; Roquebrune-Cap-Martin, France, 1965). After attending a course devoted to watch ornemental engraving at the School of Art of La Chaux-de-Fonds (1901-1905), he successively stays in Florence, Budapest, Vienna, and works for a while in Paris Auguste Perret’s architect studio. Then, from 1910 to 1917, he travels in Germany, Hungary, Turkey, and Greece, countries that he brought back numerous watercoloured paintings from, which were exhibited in Paris and Zurich as soon as 1916. Having already accomplished an important architectural work in Swiss, he settles in Paris in 1917. The following year, Auguste Perret introduced him to Amédée Ozenfant. Together with Ozenfant, Jeanneret (Le Corbusier) exhibits his first oil paintings at the Tomas Gallery in Paris, and publishes the Manifesto of Purism, entitled After Cubism. The two of them reproach cubism with being decorative and with having been unable to fit in with the «modern mind», that is to say industrial civilization characterized, according to them, both by the use of machines and scientific progress. Charles Edouard Jeanneret looks for « invariants » in the arts which would be what laws are to science. His paintings are inspired from building methods as well as from the finality and aesthetics of industrial machines. They define « a general grammar of sensitivity » : shapes and colours are simplified, structures are based on the right angle and on «regulating lines». The figure remains present, if not essential, in still life compositions combining everyday life objects, such as plates, glasses, carafes, smoking pipes, bottles, which are functional and mass produced at a low coast. So their shapes, simple and standardized, can easily be assembled, while remaining legible. These objets are represented according to methods borrowed from draughtsmanship, using the plan, elevation, conventional perspective, with projected shadows following the laws of the perspective. « A painting can be created the way a machine is created. The painting is a device to make people feel.» (Bol blanc, Paris, 1919, Fondation Le Corbusier ; Nature morte aux nombreux, Paris, 1923, Objets, 1923, Paris, NMMA [Musée National d’Art Moderne]). That theory has been developed and clarified as the two of them (Jeanneret and Ozenfant) were going on with their pictorial practice, as well as in a sequence of articles pubilshed in the review «L’Esprit Nouveau», which was founded by poet Paul Dermée, Ozenfant et Jeanneret in 1920 : those texts were summed up in La Peinture Moderne (Paris, 1925), which they edited together, and which was acclaimed by the international artsitic community. Jeanneret’s activities as architect and townplanner, and as writer and theorist besides, would gradually take over his researches in painting. Around 1926, Jeanneret gives up the aesthetic qualities of Purism, while gradually reintroducing figurative representation as well as a freer kind of construction. 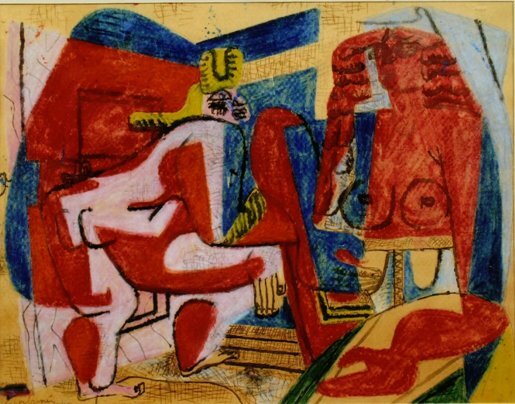 From then on, he will sign his paintings « Le Corbusier» (1928). For a moment, he experiments with a strange synthesis of monumental. During World War II, he takes refuge at Ozon, in the Pyrenees, and then devotes almost exclusively to painting. After the war, in the course of his many travels, he writes, draws and writes artistically (Le Poème de l’angle droit, Tériade publisher, Paris, 1955). He executes numerous murals in keeping with his activities as an architect (Swiss Hall of Residence, Paris, 1948-1949). In 1952, he launches a long series of «Bulls», paintings in which the figures made of black lines do not coincide any longer with colored planes (Taureau 6, Paris, 1954, M.N.M.A ; Bull 6, Paris, 1954 National Museum of Modern Art), and draws many sketches for tapestry work which were realized by the Aubusson Factory and the Gobelin Factory. The Le Corbusier Foundation, in Paris, some of the artist’s works, whose interest has often been eclipsed by the fame of his architectural achievements. In 1987, in order to celebrate the centenary of his birth, events and retrospectives were organized everywhere in the world. From Dictionary of Painting, Larousse Publisher.